It’s a very easy case to make when advocating a No Fill Light - One Light set-up for portraits for individuals, but when doing groups—now that will make many photographers really nervous! Removing the fill light from most photographers’ studios would be like taking away a toddler’s security blanket! 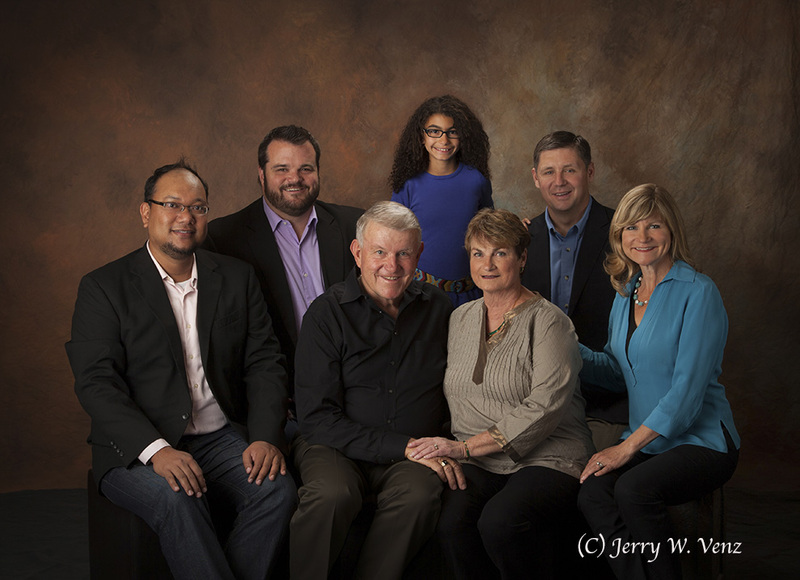 I must say that when I retired my 36x48” softbox, which I KNEW was incapable of group portraits without a fill-light, and upgraded to the Photoflex, 7-foot, Octodome, I was skeptical before I tested it. In fact, when I first set-up my new studio, 6 years ago, I put up my usual fill light, in a big silver umbrella, up high, behind me—just in case. I wanted my blankie near me! I found that when used properly, placing that big light as close to my subjects as possible (without being seen in my viewfinder) the results were fabulous! Of course, I tried it both ways—turning the fill light ON for comparison and the fill light just flattened out the light—making a boring two-dimensional rendition of my subjects. You need a hair light to put some sparkle and separation of hair especially with dark backgrounds. You need at least one background light and often two-lights as the group gets larger because the group blocks light and makes the background much darker on the side opposite the main light. What I’m eliminating is the 5th Light—the Fill Light—the only light that is creatively destructive to the studio portrait. As proof of concept I offer the following image. It was a Professional Photographers of America, International Print Competition, Loan Collection Winner in 2014. 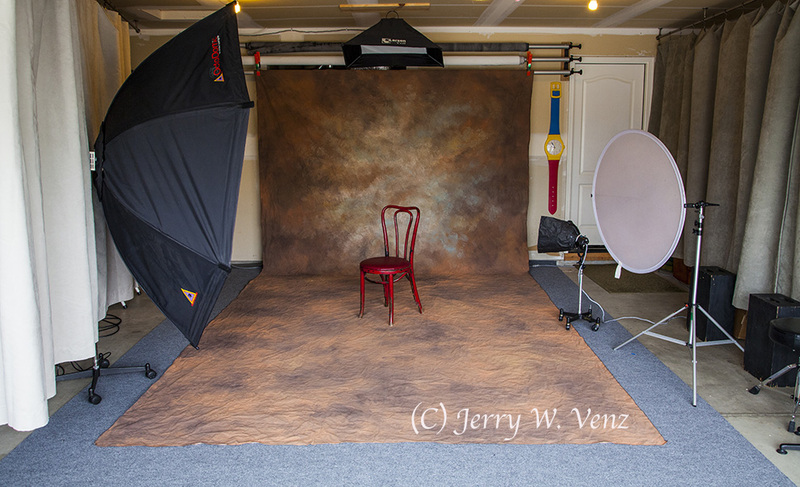 This was my first studio set-up with the 7-foot Octodome. Note the white reflector on the stand on the left. Most importantly notice that my main light is on wheels. You need to easily move your main light, otherwise it may take root, as I’ve seen in some studios, never changing position again! 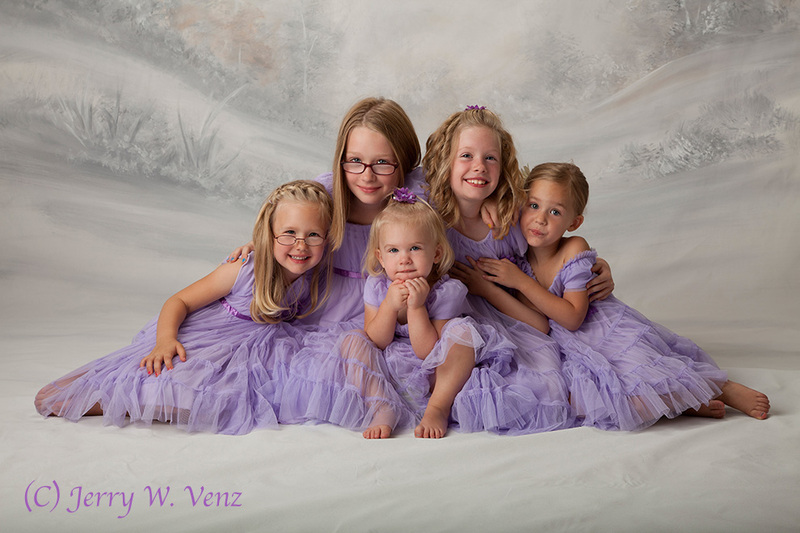 This next group portrait with 6 Adults and one child pushed my new studio to the limit. We’ve moved our studio into our home and made the two-car garage into the camera room, so with groups any larger than seven or eight people we go outside to the many beautiful outdoor Idaho locations. 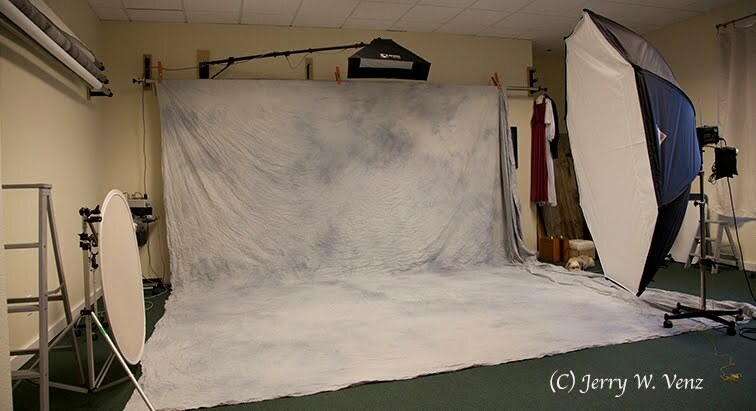 It does not look very big, but the background displayed is 10 feet wide and 20 feet long and the wall mounted Bogen support poles are 12-feet long. The 7-foot Octodome is placed in about the right position for a group, as is the single background light, to the right, on the little roller stand. The biggest difference between this larger group and the portrait of the girls is the spacing of the subjects—making the group wider—so with more distance between my main light and the people on camera right there’s light fall-off. That creates darker shadows on the people at camera right. Stagger the Group: I set-up the seating so that they are not just lined-up flat to the camera. They’re on a diagonal with the people on the right closer to the camera than the people on the left. Increase reflector efficiency: Instead of my usual white reflector I used two Silver reflectors to balance their facial shadows. Feather the Main Light: With larger groups you can’t just point the light at the group or you’ll over expose the near people and underexpose the far people. So, I point the Main Light AT the Silver Reflectors on the other side of the group. So, that’s all there is to it! Piece of Cake! No, not really—this is the most difficult kind of studio photography; the more living, breathing, people or critters in front of the camera the harder it is! In closing, I’d encourage photographers, as I mentioned in my prior Blog One Light Studio Portraits—Individuals, to study lighting outside the photographic community. The classic painters 350 years ago knew how to use directional light to create the shadows that made their subjects three dimensional. CONTROLLING BOKEH: LENS OR APERTURE?